I need to hold and fly cut a ratchet and am trying to figure out what is the best approach. I have found little information on ratchet wheel design and fly cutting. I get about 4 hours a week in my shop in increments so iam seeking advise to the best approach. My design needs a ratchet that will wind the mainspring. Iam not an engineer except in my heart but thinking a 1 1/2" ratchet on the diameter and about 3/8" thick. My universal dividing head does not have a chuck so it will need to be held between centers. How would you hold this blank knowing that you would be fly cutting the ratchet teeth or shaping them using a slotter. Also looking for responses with regards to ratchet tooth shape design and approach. The ratchet will be apart of the mechanism that winds the mainspring which is .018" thick x .75" wide and 120" long. This task is not too dissimilar to gear cutting. You should be able to find plenty of examples on the internet. 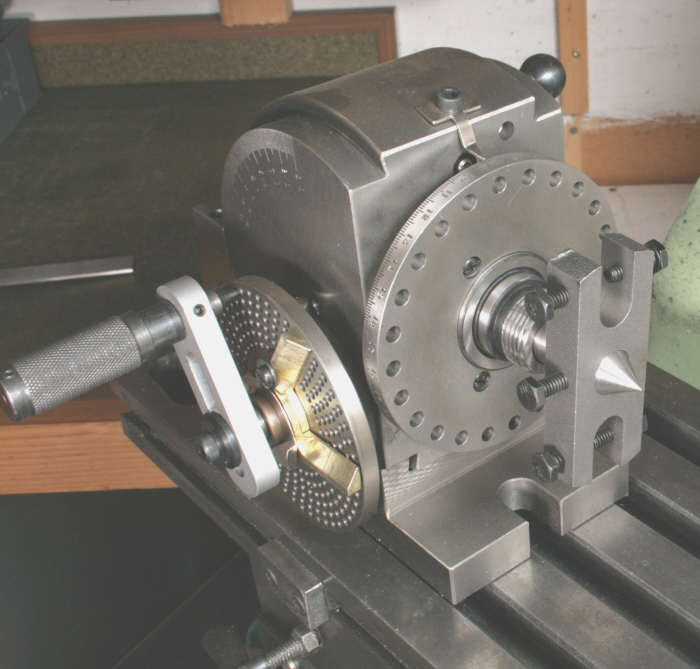 You have not stated what equipment or machines you have to do this but a spin indexer may be a good option if you do not have a chuck on a rotary table. Have you looked at clock making sites and clock pictures that will show you the shape and aspects of making a flycutter to cut it with. Also Meccano do one about 3/4 in diameter, again shows you the shape. There are some videos on youtube too specifically but not the one by Stefan which is not the type you want. As the old saying goes: "if I were you, I wouldn't start from here"
This might be heresy to say but have you considered buying one? They are available for steam engine lubricators and such. I completely understand if you want to make one for the enjoyment of the process, however if you are not too wedded to that idea you can purchase one for not much money. 3/8" thick! 1/8" should be plenty? You have to fit it to a spindle, make an over length mandrel that fits the bore of the dividing head with the same fitting on the end. Easiest shape is to use an ordinary end mill set to cut just past the centre line of the blank, depth set so each tooth cut leaves a tiny witness before the next one. Your universal dividing head should have come with a drive bar so you don't need a chuck. Mount the wheel on a decent length arbor and support the other end with a tail stock (can be bodged up if you don't have one) and then just drive the arbor with the dog from the drive bar. The long arbor will allow easy access for the flycutter without excess tool overhang or running into the head/tailstock. Driving with a worm and wheel might be an alternative, as they can easily be arranged as a non-reversing drive. Maybe look up why Fordson Standards killed so many operators, to see how effective they can be? They might need tidying and modding for what you want, but perhaps they'd work? Flycutter insert is made from silver steel to match the desired profile. The slight undercut required on the tooth form is achieved by setting the flycutter tip just below centre height with the ratchet direction as shown in the photo. If you are taking a slice off a bar to make the disc, perhaps cut the ratchet first. Centre the bar each end. part part way through the bar at the required thickness, then set up between centres on the mill. After the ratchet is complete, put the bar back in the lathe, bore the hole for the shaft and complete the parting off. More solid than using a mandrel. Not sure why but i responded to several responses and none had posted. Thank you for the different replies and the various ways to skin this cat. I would like to cut it all out of one bar and transfer from lathe to dividing head but what a waste. That is a nice set up Russel and something I want to replicate. I may have to take my 4 jaw and make it fit the dividing head. Will that fly cutter cut all teeth without sharpening? I may have to take my 4 jaw and make it fit the dividing head.
" My universal dividing head does not have a chuck so it will need to be held between centers. " You might have to turn up a spindle nose to take your chuck with a Morse taper to fit the dividing head, make it with a thread in the end of the taper to take a draw bar. Or you can do as I said earlier and you can do it between centres, and there isn't a great big chuck getting in your way. I have opted to make a mandrel and do the whole operation between centers as you suggest. I am turning the mandrel down to size today. I would like to somehow incorporate a positive lock via a collar clamp and a pin through the ratchet wheel. I will post pictures of set ups when i can figure out how to post them. Yes, no problem in brass. I made the fly cutter insert insert from silver steel, hardened and tempered to a medium straw colour. It has cut a few ratchet wheels without sharpening. I was going to do the ratchet wheel out of cold rolled steel and make a brass or cast iron pawl I will be winding this mainspring to the max. What do you think? Russell is it possible to see more detail of your fly cutter? I have made one but i dont trust it in this application.